German Shepherd Dog Puppies For Sale? Current Litters? Planned Litters? It seems everyone that sees us out with our dogs, or visits our website is asking...Are you going to have puppies for sale? The short answer is we plan to. HOWEVER! We will not breed our dogs until after they are 3 years old, and we know that they have sound bodies and minds. Our dogs will NOT be bred every heat cycle. Our dogs were not bought to be bred. 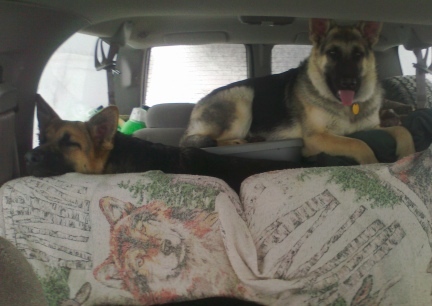 We bought our dogs because I LOVE the breed and had owned GSD in the past for many years. Our dogs will be, above all, Farm Dogs here on our 161 acres with many types of other animals. Our dogs will also be Guard Dogs, Backpacking Dogs, Sled Dogs, Obedience Dogs, Agility Dogs, Our Constant Companions as well as, WOW! us with their Tricks. We own our dogs as pets and working dogs. We spend a lot of time enjoying the company of and training our dogs. We hope to compete in Sled Dog Races, Weight Pulls and other events with our dogs. (page update) See Navigation, at the top, for GSD Puppies For Sale to see if we have current litters for sale. While our dogs have pens, they do not live in them. They are usually right with us, in the house or riding around with us in the vehicles, beside us on bicycles or helping around the Ranch. That said. We did buy dogs that are of superior stock. We have pedigrees on our dogs back to Germany in the 1800's. We bought dogs that we would be able to breed so we could not only keep dogs of good parentage, but also sell puppies of High Quality. 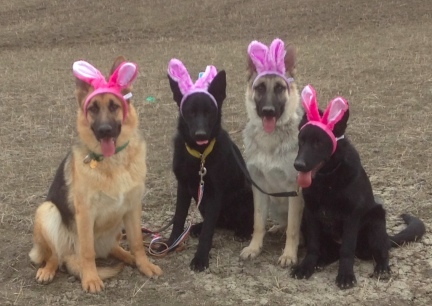 We bought our GSD from not only South Dakota, but found wonderful total black GSD from parents in Texas that are not only working dogs with very high Schutzhund drive, but are also recent imports from Czechoslovakia. We are also patiently waiting for very good friends in Tennessee to breed their lines so that we can own puppies from their good breeding. It might be a year or two, but GOOD, CORRECTLY BRED DOGS ARE WORTH WAITING FOR! These dogs in TN are bred as ours are and the owners have owned trained and bred GSD for over 30 years. Their lines are from Wisconsin, Tennessee and Georgia. Juanita uses the same eye <read = is as picky as I am about body style and brains as I am> The dogs they own are also working dogs. Their dogs are Farm Dogs, Herding Dogs, and Guard Dogs that spend every minute with their owners as ours do. So, yes, we do plan to breed, but not until our dogs are fully mature, at least 2 y/o and found to be sound in both mind and body.....and they are on their way to both. We are located in NW South Dakota SD, very near North Dakota ND, Montana MT and Wyoming WY. Colorado is not that far from us, neither is Nebraska NE.